Are you a fast and accurate writer? 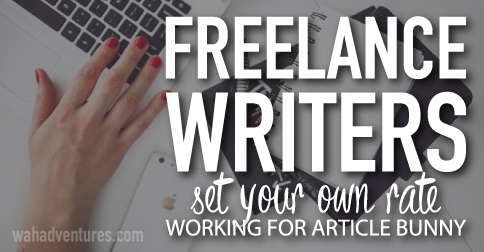 Are you tired of making the least amount for your writing? Then ArticleBunny might have something for you. ArticleBunny is a site where writers offer their services to clients. ArticleBunny is a spinoff of Bunny which is a voice-over company launched in 2012. ArticleBunny was launched as recently as June 2015 and has clients all over the world looking for those writers who are proficient in English. They are seeking writers who demonstrate professionalism, speed, availability, good communication, and creativity. The writers at ArticleBunny are very carefully screened and have been through a series of assessments and tests upon applying. ArticleBunny wants to maintain a high level of professionalism and not only exceed the clients’ expectations, but also deliver the work on time and to the clients’ specifications. Less than 1 writer out of 10 will get accepted upon applying. So be prepared that the standards are rather high, much more so than content mills if you are used to writing for those. The client may also request unlimited revisions as long as the revisions are within the scope of the original project. In other words, the revisions cannot qualify as a rewrite. The management staff at ArticleBunny will manage the revisions, delivery, and payments. The client can search the database at ArticleBunny to find the best writer for their project. This is called direct booking. Clients may take as long as they need to browse the selection of writers. The client can post a project and have “Mr. Bunny” find the best writer for the project. This is called “speedy” because it only takes a few hours. The client can hold a contest and then “Mr. Bunny” will find several possible writers for the client. The writers compete via writing a short article or sample. The client then selects the winner for the newly awarded project. The turnaround for this is about one day’s time. What Are the Requirements to Work at ArticleBunny? The requirements are to be able to pass all of the assessments and be accepted first and foremost. Then, upon your acceptance, you will need to maintain good metrics in order to stay. Again, ArticleBunny is still a new company upon the writing of this article, so it will be interesting to see how they evaluate and re-evaluate their metrics. It currently doesn’t look like they hire outside of the United States for their writers, but again they are new and that may change. Is ArticleBunny Full-Time or Part-Time? It can be either one, but like all freelance work, it can be very busy or very slow. As an independent contractor, you may set your own hours and work around other things as long as you are cognizant of any client deadlines. They do give preference to those writers who make themselves available more often and communicate when they cannot be available. However, those writers that do make the cut tend to make ArticleBunny their main—not only—source of income. You can set your own rates and then ArticleBunny will add their profit margin to what you are charging. This would be for direct billing. Now if you are using “speedy” or “contest” as described above to work with clients, then ArticleBunny will take a percentage from that. They never really state how much they take, and I wasn’t able to find out since they are still fairly new. The client is charged $49 USD (300 to 400 words) and up to $236 USD (1,600 to 2,400 words) for a “speedy” project. Obviously, this is before ArticleBunny’s percentage comes out, and it depends upon the length of the project. For a better description of their pricing see the pricing page. Payments can be made via PayPal, Payoneer or Wire Transfers. Are There Any Special Software Requirements? 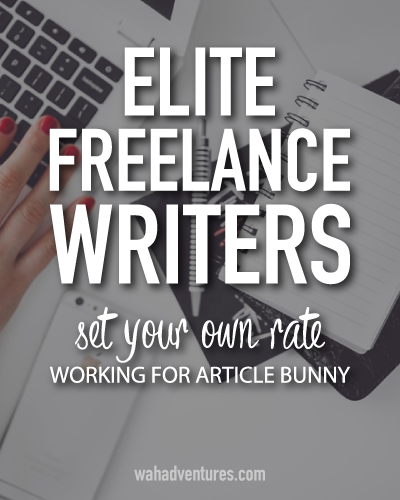 Just the common sense basics that you need to freelance write just about anywhere are required at ArticleBunny. This would be an updated PC or laptop with an updated operating system and anti-virus and anti-malware software installed. It also wouldn’t hurt to have a product like Grammarly or Ginger installed either. How Could Interested Individuals Apply to ArticleBunny? While ArticleBunny does prefer that you be nominated by another ArticleBunny writer or one of their clients, you can nominate yourself. Upon nominating yourself, you will go through a series of tests. If accepted, then you can go ahead and set up your online account and portfolio—very similar to how you’d do it at Upwork or one of the bidding sites. To start the process, you may go to this page. Good luck to all who apply. Seems like a great work at home opportunity! I applied. They sent me an email back saying I did not meet qualifications and that they only accept 2% of people who apply. @Lexi – Yup, for sure. They are quite selective. The cool thing about Article Bunny is that they really do have some gigs that pay decently – this isn’t a place where you’ll be stuck writing 5 dollar articles or something. The only catch is that the high-paying gigs tend to get snapped up in a hurry. But if you’re able to keep an eye out for jobs as they pop up, you’ll definitely increase your chances of being selected. @Avery Breyer – That is great! That is what I hear. Well, I got accepted but there doesn’t seem to be much work available right now. Am I missing something? Do most people book writers directly rather than the contest or speedy options? I’m in the same boat. Cheap work is better than no work. Almost impossible to get stay work on article bunny. I get maybe one article job every three or four days. By the time I get to my computer to click accept (30 seconds) the job is gone. Most of the articles don’t even remotely match my portfolio either. Great idea, so far needs a lot of work. I worked for them, they are called Writing Bunny now. They are one of the most unprofessional, rude services out there. I’d advise both writers and clients to stay far, far away.